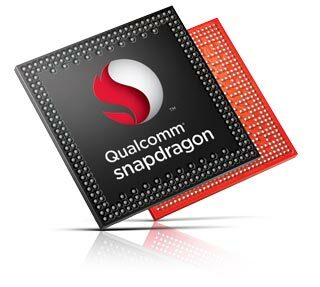 The Qualcomm Snapdragon 810 MSM8994 is an high-end ARM-based SoC largely found on Android tablets and smartphones. Announced in April 2014, the S810 is the successor to the Snapdragon 805 and started shipping in the first half of 2015. In addition to 8 CPU cores (4x Cortex-A57 and 4x Cortex-A53), the SoC integrates an Adreno 430 GPU with a 2x 32-bit memory controller (LPDDR4-3200, 25.6 GB/s) and supports Wi-Fi (802.11ac + MIMO), Bluetooth 4.1, UMTS, and LTE. The Snapdragon 810 is based on ARM's big.LITTLE concept, which combines different CPU cores for an optimal combination of performance and power consumption. In this case, there are four fast Cortex-A57 cores clocked at up to 2.0 GHz, which offer somewhat more performance per clock compared to the previous Cortex-A15 (e.g., Tegra K1) design. Furthermore, the SoC integrates four slower, but much more efficient Cortex-A53 cores clocked at 1.5 GHz, which will handle background tasks and simple applications. All eight cores can be active at the same time, although most applications aren't parallelized to support 8 cores efficiently. Both Cortex-A53 and -A57 are based on the ARMv8 ISA and are therefore 64-bit capable. Overall, the Snapdragon 810 is one of the fastest ARM-based SoCs in the first half of 2015, even though it cannot beat the Samsung Exynos 7420. The Adreno 430 outperforms the previous Adreno 420 (Snapdragon 805) by almost 30 percent. Therefore, the chip ends up slightly faster than the PowerVR GX6450 (Apple A8), but somewhat below the Mali-T760 MP8 (Exynos 7420). However, the GPU may throttle significantly in long-lasting benchmarks or games. Nevertheless, it offers sufficient power for high-end devices with display resolutions exceeding FullHD. The Snapdragon 810 offers numerous wireless technologies such as Bluetooth 4.1, WLAN 802.11a/b/g/n/ac + MIMO as well as a dual-SIM cellular modem supporting LTE cat. 6 (up to 300 Mbps), WCDMA, CDMA, EV-DO, TD-SCDMA and GSM/EDGE. The SoC can encode and decode 4K videos using dedicated hardware and stream content to up to two external 4K displays (1x 60 Hz, 1x 30 Hz). A large number of video codecs including H.265 will be supported. The dual ISP can handle cameras with up to 55 MP. Thanks to the new 20 nm process, the energy efficiency has been improved noticeably compared to its 28 nm predecessors. However, the chip is still extremly power hungry and much more effected by throttling than the 14 nm Samsung Exynos 7420.